Husband and wife, Marc and Gillie Schattner are Australian contemporary artists who collaborate to create art as one, applying the iconic imagery of the dog or human hybrid to celebrate the powerful spiritual relationship that exists between man and animal. Gillie and Marc reference their own remarkable love story in their works, perpetuating a pursuit of happiness and encouraging us to challenge the status quo and perceived safety of societal convention. Gillie and Marc's unparalleled love is the cornerstone of what they are and what they create. Meeting in Hong Kong, she was a nurse from England and he, a boy from the suburbs of Melbourne. Wanting only to find a soul-mate with whom to share their passions for art, travel and adventure, they were married at the foothills of Mount Everest seven years later. 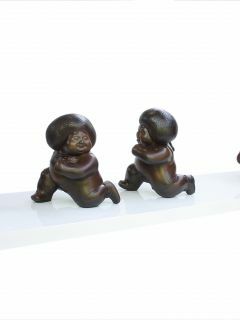 With a 20 year history of collaboration, Gillie and Marc's works (paintings and sculptures) have received worldwide acclaim and are held in collections both nationally and internationally.